Update: Gold, Silver and the U.S. Dollar. My last update on the long-term performance of the Dollar, Gold and Silver was posted on April 25th, just four days before the S&P 500 set its interim high (click to view). Here now is a fresh look and the world’s reserve currency and the two metals, starting with a 20-year timeline for the Dollar and Gold. Since late April, the Dollar has been in a narrow range with yesterday’s close down 0.2% from our last inspection. Gold, in contrast, has risen 18.59%. What about Silver? It has been more volatile than Gold, but over the same timeframe, it has a nearly identical gain of 18.11%. The next chart starts the timeline in 1980, the earliest date my source, Stockchart.com, supplies data. Gold and Silver data are available across the complete timeline, but the Dollar tracking begins in mid-1983. 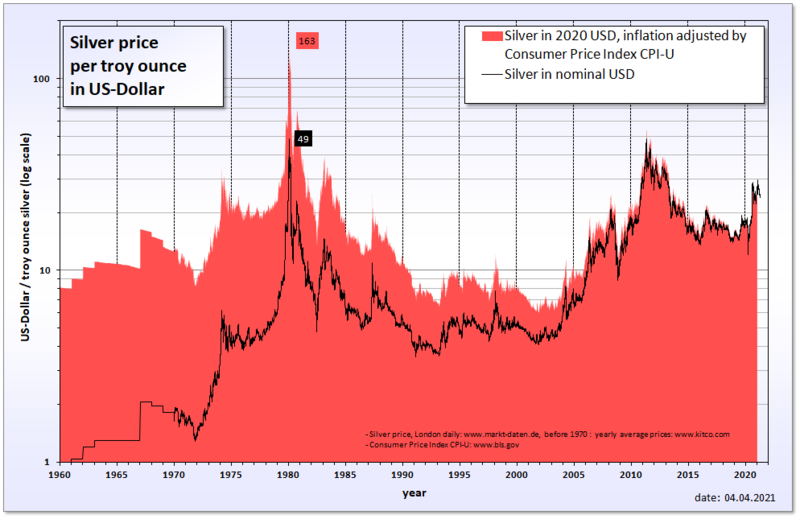 By starting in 1980, we see the downside of the historic bubble in Silver that peaked on Silver Thursday, March 27, 1980. The circumstances surrounding the 1980 Silver Bubble, nicely summarized in this Investopedia article, were unique in modern history. In nominal terms, Silver is back in the territory of the 1980 bubble, but in real terms, and in light of the global financial distress, precious metals will doubtless remain attractive to many investors. What about the Dollar? As of yesterday’s close, the Dollar is down 55% from its 1985 peak. I won’t hazard a forecast as to where it’s headed, but I wouldn’t be surprised to see the range of the past two years set the boundaries for the next several months.